Like many Irish people who flock to Spanish shores every year we tend to focus on Southern Spain where sunshine is almost a guarantee, especially at this time of year, however as we discovered this month there is so much more to this beautiful country than sun, sea, sand and sangria. 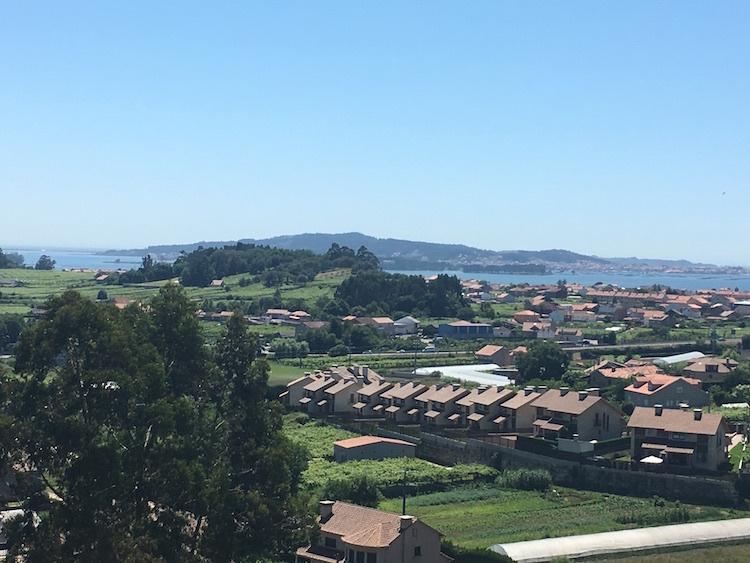 We recently spent four days touring around the stunning Rias Baixas region in North Western Spain to explore not only the scenery, food and culture but also the rapidly emerging wine region that is scattered in tiny parcels all over Galicia. We travelled with a small group of media and wine merchants, none of whom had had the pleasure of visiting the home of the one of Ireland’s fastest selling wines varietal – Albariño. It was a surprise to all to learn that Ireland is now currently ranked 8th in the world for exports of wine from the DO Rías Baixas, it seems our love affair with these easy to drink, crisp and refreshing wines shows no sign of abating as we have tripled consumption in the last five years. For a DO or official denomination which was only created in 1988 it is a huge testament to the passion of the hundreds of small vineyard owners and quality of the wines that today over 5.7 million litres from the DO are exported around the world for all to enjoy. One of the reasons for their huge success is how easily they pair with most foods which makes them extremely versatile. 99% of all of the wines produced from the region are white, with over 90% of all vines planted from the Albariño grape and less than 1% red or Rías Baixas Tinto. If you have yet to visit a winery but always had that yearning than this is the perfect place to combine some of the finest food and wine Spain has to offer with some of the most beautiful landscapes you could imagine. Known as “Green Spain” due to its green fields and rocky granite landscape it is often compared to Ireland, so it seems we have more in common with Galicia than we may think. A short flight to the historical city of Santiago airport is available direct with Aer Lingus and is an ideal starting point for touring around the region. Santiago de Compostela is the capital of northwest Spain’s Galicia region and ono of the most culturally rich places on Earth. Dating back to the twelfth century, cobbled stoned alleyways twist and turn around each corner to reveal a vibrant city full of striking churches, beautiful architecture and a myriad of little bars and restaurants dying to be discovered. 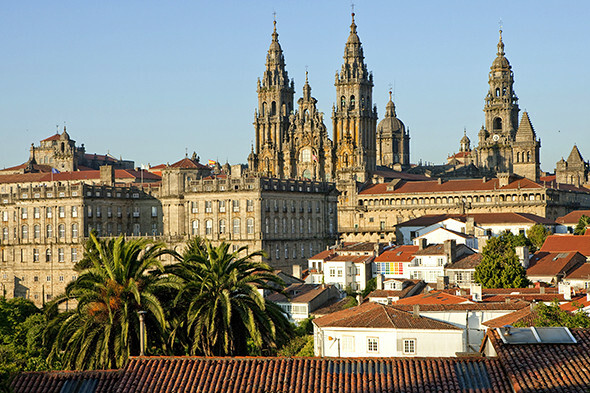 The heart of the city lies at the breathtaking Cathedral of Santiago de Compostela which opens out onto the a lively square that comes alive at night to a host of entertainers, poets and musicians. So skip the onerous task of walking 30km a day around the camino and instead sit back and soak in all this wonderful city has to offer up. You can’t ask for a better location than San Francisco Hotel Monumento, originally an 18th century convent which stills houses the church and many of the historical features. They have managed to combine a seamless combination of old and new, with state of the art facilities in a truly historic setting. It is also one of the few hotels in the city which houses a covered and heated swimming pool should you fancy a little dip. Top this with one of the most delicious buffet breakfasts full of Galician delicacies and elegant rooms with views of the Monumental District and you have the perfect escape. If you really want to push the boat out and sample luxury at its best then the five star Parador Hostal Dos Reis Catolicos is hard to beat. Set in the vibrant Obradoiro Square near the cathedral, it was once a royal hospital with most of its original features still retained, there is a Baroque theme running through every inch of this exclusive venue, it oozes history at every turn. Rooms are opulent, housing high ceilings and stone walls and all have enviable views of the surrounding countryside. As much as we love a bit of history, we love good food more and Santiago has it in spades from the smallest of tapas bars to the five star locations you will be spoiled for choice. It is one of the best places to uncover all the gems from sea, land and farm that this unique area has to offer. Although there is a more opulent setting right next door in Restaurante Especial, with its vaulted ceilings and almost regal dining room we chose its little sister which is slightly less intimidating and is serving up some seriously good Galicians treats. The menu is based around traditional tapas local to the region and are served family style with plates from €4.50. Highlights for us were the crunchy and flavoursome “Fried Lobster Hands” (€7.50), the Baked scallop which you will find on pretty much every menu in the area and are a must try, fried sardines and salty little Padron peppers which are notoriously addictive but watch out if you get a hot one! Service in Restaurant Enxebre was friendly and helpful. Wines are so reasonable with prices from €2.20 a glass. We chose a fantastic bottle of sparkling Albariño – Altos de Torona which had a fine bitterness and balanced the shellfish perfectly and at €25 for the most expensive wine on the list it was beyond a bargain. We took a short spin out early morning to visit the Salnes area about an hour and a half away, the region itself is a huge producer of Albariño’s and many examples have a hint of saline on the nose due to its cool climate and close proximity to the Atlantic coast. Tastings are regularly held at Maoir de Mendoza and Marco Barros the winemaker is always on hand to give you a tour of their stunning pergola vines which are grown without using herbicides or environmentally-unfriendly products and most importantly a taste through their delicious portfolio. Set in high in the hills overlooking the Salnes Valley and some of their working vineyards this is one of the slickest looking wineries in the region. 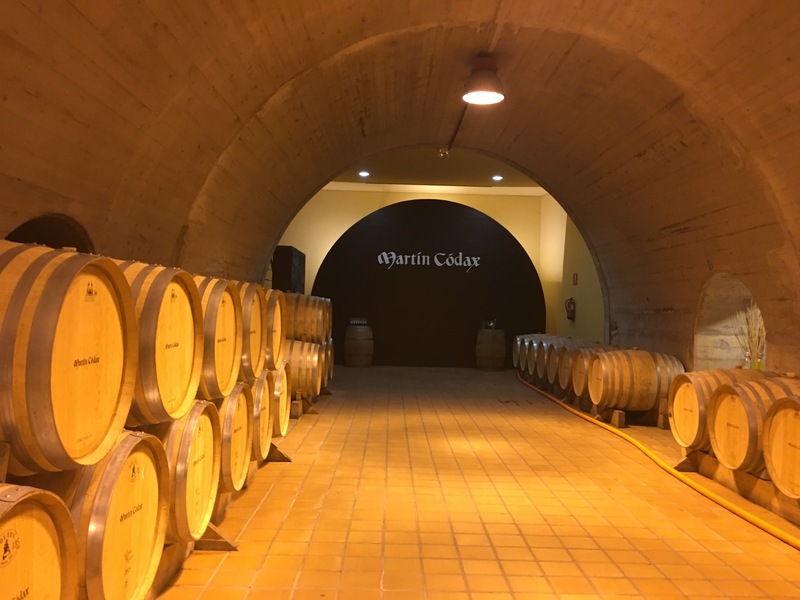 Bodegas Martín Códax is surrounded by cultural and art expressions, named after a famous Galician poet the wines are made from a collaboration of 300 families whose grapes ae gather to blend some of the best examples in the region. It is open to the public Mon-Fri and would be our number one recommendation to visit as there is a huge variety of wines to choose from and it is one of the most striking and unique setting we were lucky enough to visit. Pontevedra is the the region’s most southern sea facing province and much like Santiago it has a huge amount to offer to tourists particularly in the old town and is just an hour from Santiago by car. 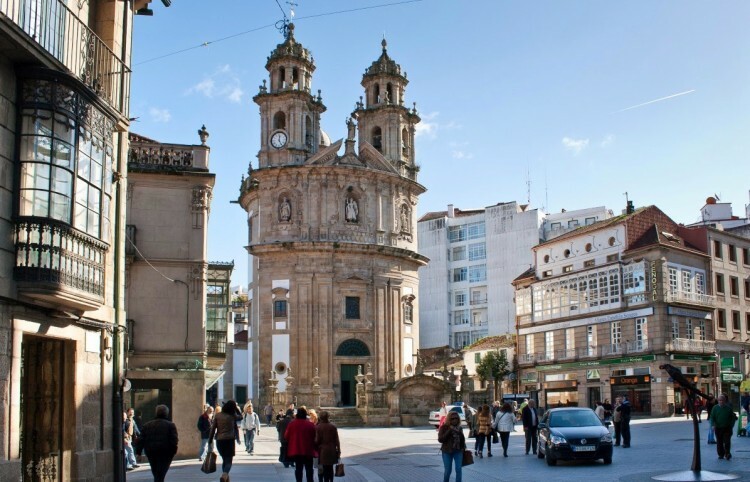 Pontevedra has its fair share of historic buildings, churches and monuments, along with plenty of buzzing plazas and a large shopping district packed with some fantastic artisan stores showcasing some of the best wines, cheeses and other local delicacies. Thankfully flying Are Lingus we had a 20kg baggage allowance which came in very handy after our short two day stay! The old town really comes into its own at night with a vibrant atmosphere and plenty of late night bars offering some hard to beat prices in a relaxed and friendly setting. In what was once a sixteenth century palace, in the historical area of Pontevedra, you will now find this little bit of luxury tucked away in a very unassuming location. From the moment you step into the lobby you can sense you are in a place steeped in history, with an impressive carved stone staircase and antique candelabras decorating the lobby and noble furniture immaculately maintained and scattered throughout the building. Pontevedra is best discovered on foot as many parts of the city are pedestrianised and it is by far the best way to discover the many gems this unique destination has to offer. Sometimes a place really surprises, this one however blew us away. Right in the centre of all the action on Praza da Leña is a little square packed with a hive of great bars and restaurants. Eirado da Leña really showed us the true gastronomy of the entire region as we were taken on a journey through 13 small courses of all the best produce Galicia has to show. Their whole ethos is to create a “home dining room in a restaurant” and that is precisely what Head Chef Iñaki Bretal has managed to do. The dishes on offer here are not only visually striking with plating likened to any Michelin eatery but it is the flavours which will send your taste buds into overload in all the right ways. If you only visit one place in Pontevedra this has to be it. One of the most delectable foie gras dishes we have ever sampled Eirado da Leña is punching way above its weight and has a wine list to carry off each of the sublime dishes they are creating. Situated almost directly across from Eirado da Leñ you will find another very popular venue in Pontevedra, a favourite with locals and tourists alike. With a focus on more tradition Galician dishes and a super little outdoor terrace where you can soak up all the atmosphere this magical city has to offer. Well priced and less contemporary than its neighbour, you can easily see why it is the No1 rated restaurant on TripAdvisor in this location. O Rosal offers up some unusual Albarinos as it is situated further south along the Portuguese border, with just the river Mino separating it from Spain. With its rich soils, heavier rainfalls and low altitude it is has the perfect conditions to develop a rich minerality in the wines from this region. In fact many Irish readers will be accustomed to seeing quite a few Valminor wines in Irish multiples, it is seen by many as one of the leading wineries in the region. The winery itself is only too happy to give visitors a guided tour of their cellar and show you the different processes of winemaking in an informal setting. When you roll up to this bodega you are in for a serious treat, more reminiscent of a texan ranch, this picturesque setting reveals some of the finest wines in the region which you have probably come across on quite a few restaurant wine lists of late and with good reason. Producing over 1.5 million bottles a year across the group with three wineries which are now all combined, this is a serious operation. An impressive tasting room overlooks the many acres of vines and the wine production and bottling lines are all available to explore through group bookings. Probably the biggest household name in the Irish Albarino market thanks to its distinctively fun labelling often known as the “Polka dot wine”, Paco & Lola was for many was the first introduction to Albarino in Ireland It is a young and ultra modern winery, constantly experimenting with blends and new varietals. Only founded in 2005 it has become the largest cooperative in the DO Rías Baixas with over 400 members. The winery itself in many ways is a mirror image of their branding, slick, modern and bold. Visitors can be taken on an on-site guided walking tour of pretty much all the facilities, even the receiving area where the harvested grapes are brought in and the cost a mere €2pp for a chance to see all the intricacies of a working winery. And so that is just a small flavour of what this unspoilt part of Spain and Rias Baixas has to offer. If you can’t make it this beautiful part of the world anytime soon then pop into your local wine shop and bring a little part of Galicia home with you.